Photo courtesy of John V.
Excuse me, is there a reward out for the safe return of myself to me? I think if I were stolen, I would just steal myself back. Hey, it’s a dog-eat-dog world out there……..
And if horse is out, please to be closing barn door. Hey, but if you are sexually abused, don’t come crying to me! And if the guy stole the police too? I was already stolen twice! I KNOW what to do, for Gosh sakes! Please have picture of you handy. Oh snap! My phone’s stolen too! Where is Liam Neeson when we need him? Before to call, eating breakfast for long life. Each 18 dollar West Many Privates police to bringing. Very good advice if they don’t steal your phone. ………. And they don’t even leave a f*cking number! This happens to me all the time, try my advice. The police are good for nothing call your local grocers, they’ll send you a bag of fresh herpes for 95 cents only, then douse the stealer with them. because possesion is kyu % ju of the law! japan… we wife swap for keeps! But if you lose consciousness, please remember CPR. I actually read in one of the “Dumb Criminals” books that a Chinese kidnap victim was taken to Canada and was told to call his family to tell them their ransom demands. The victim, speaking in Chinese (which the kidnappers didn’t know), told his family where he was, and the police were able to find him and the kidnappers soon after. So a Chinese “stolen person” really WAS able to contact the police, albeit indirectly. And If cremated contact your local crematorium. If you are kidnapped, please call morgue asap. if you are stolen yourself, what about you ? ME: I’m here to collect the reward. ME: For the capture of my kidnapper. If you see someone stolen, let the police call them. You have to find yourself first, though. – You have a right to remain stolen, Sir. I should really lock my doors more often. Last night burglars broke into my house. I looked all over and it appeared at first that nothing was stolen. But then, I realized – I didn’t see myself! I had been stolen! 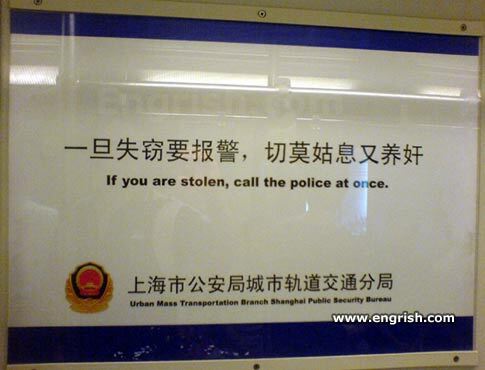 They have such a problem with people getting stolen in Shanghai that it became a verb.